The cage and furnishings you use depends on how much time your ferrets will be spending in it. This is a guide about setting up a ferret cage. I picked up a smooth tile to use as a dry erase board, then decided to use it instead for the ferret cage. Although I have a meatloaf pan in the cage for a litter box, I put the tile in the corner where the ferret sometimes goes, and it is so easy to clean up. It is better than using a paper towel, because you just pop it out, wipe it off, then pop it back into the cage. Tiles are also a good paper weight and they are fun to use as dry erase boards. If using as a dry erase board, be sure to use the smooth shiny kind and not the rough surface kind. 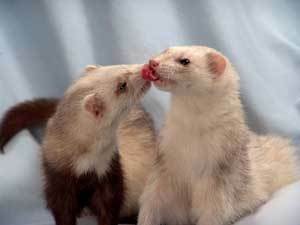 Or, perhaps we should say, setting up a cage for ferrets, because they are generally happier in pairs. The type of cage you select depends on how much time your ferret will be spending in it. If he'll be spending most of his time, like more than eight hours a day, in the cage, you want to give him as much space as possible. At minimum, you want a cage that is two feet high, deep, and wide. A smaller cage will serve if your ferret will only be cage-bound overnight. Ferrets are active and inquisitive little guys, so you should provide some entertainment in the cage. Your ferret may like a hammock or some tubes and ramps, but he may also be really bored and just curl up and sleep. Allowing your ferret to roam as much as possible outside of the cage will ensure a happy ferret! And don't be disappointed if your ferret ignores the fancy toys you bought him and chooses to wrestle an old sock instead. As long as his toys don't have small parts that can be swallowed, just about anything you currently own can become a ferret toy. The cage will need two things: a sleeping area and a bathroom area. Provide a small basket or cardboard box for your ferret to sleep in, and pad it with an old sweatshirt sleeve or pants leg. Get a triangular corner litterbox to maximize free space, but be sure to change the litter "every day". Ferret waste can be very odoriferous. Use a quality litter, but try to avoid the kind that clumps, it tends to get stuck to your ferret's rump. Your ferret set up will also need food and water. Any pet should have access to water all the time. A water bottle attaches easily to the side of the cage, but you can also offer a water bowl. Just like with rats, make sure the food and water bowls are heavy enough to "not" tip over. As far as feeding goes, you can offer your ferret cat food like Iams or Science Diet, but don't give them dog food. 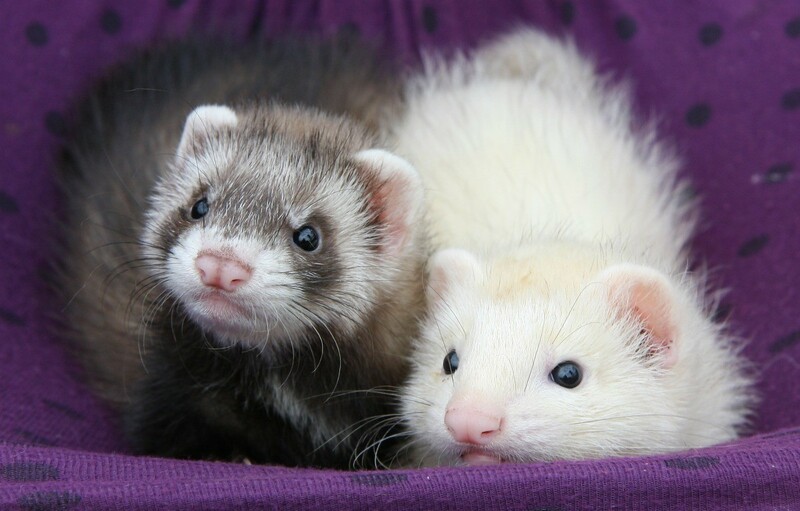 Only actual ferret food or certain high-quality cat foods have enough of the proper nutrients for your ferret. You should think about offering a daily vitamin as well. I bought my first ferret about 2 weeks ago and I love her to death. She is just a baby, about 8 weeks old. She loves to climb and crawl through everything, but I don't have much that is safe for her to do that in. I have a cage, but it's not enough. Does anyone out there know where I can get a fairly inexpensive cage and/or toys for her to play in and have a blast? Any help would be much appreciated. How wonderful that you've found a pet you can love and enjoy. First, I want to share some tips about toys you may want to keep in mind when choosing a play toy for your new ferret. Your ferrets will entertain themselves with anything they can find, but it's much nicer to give them something special just for them. Ferret-safe toys don't have parts your ferrets could accidentally chew off and swallow. Accidentally swallowed pieces of toys are a leading cause of intestinal blockage, so always monitor your ferrets' toys for damage. People are the best toy of all, so choose some toys that you and your ferrets can play with together. Tennis balls, racquetballs, and hard plastic balls. Balls with bells or other noisemakers inside are often favorites. Hanging parrot toys (usually made with wood, heavy ropes, bells etc.) are an interesting addition to the cage. Play tents or houses (several varieties of play tents and houses are available from The Ferret Store). Dangling toys like those available for cats (use only under supervision to make sure the ferret doesn't get tangled). Avoid toys made from soft rubber or latex (like most squeaky toys made for dogs) since they are too easy for ferrets to chew up and swallow. Also avoid anything with small parts that could easily break of (or be chewed off). Watch for signs of wear and tear or loose threads in the case of cloth toys and discard any toy that could potentially cause problems. Gently used items for your pet can be gotten for FREE by joining freecycle.org. We have a group of freecyclers where I live and I find them to be very happy and willing to help you out. Just post your request (i.e. wanted ferret cage/toys) and hopefully you'll get exactly what you need at no charge to you. In any event it doesn't hurt to try. Good luck and happy freecycling. First, see if you can get a copy of Ferrets for Dummies. It gives awesome advice about everything to do with ferrets, including cleaning, vets, toys, diseases, etc. It's a great source of information. Second, get involved with one of the ferret forums out there that is active. Here is one: http://www.sand  s/commandofuzz2/ You have to register and tell a little bit about yourself. Tell them you are a newbie and looking for a good place to find out about ferrets. Use my name as a reference: marliestx. They have a lot of shelter moms on there and a lot of great people who have TONS of experience. Username Cap (Alan) is the creator of this website. Third, try your shelters to see if you can get a discounted cage. They are expensive, but you need to have something safe for her to stay in when you can't supervise her, and she needs to be able to move around, have a sleep/play area, food area, and potty area. They love hammocks and sleep sacks - you can make one yourself. Toys - they love everything. Try to avoid really loud squeaky toys because it can hurt their ears. Little stuffed animals are great, as long as they can't pull off an eye and eat it and choke on it. Plastic bags are great when you can supervise. Towel rides are a blast! Get a towel and drag it on the floor slowly, and they jump on and jump off and go bananas. They also love the dryer tubes to run through. Keep water available in a lock crock in the cage, in addition to a water bottle. You have to get a lock crock because ferrets love to tip over water bowls for some reason. Keep food available all the time. They cycle through food about every 2 hours. Another thing you will need to consider is blocking off areas where she can get stuck. If there is a crack one inch thick, they can squeeze in there and get stuck/electrocuted/squashed... I've heard a lot of bad stories on that. Anytime you have questions and don't want to post, send me an email!